Your Memorial Wall testifies to your members who gave their lives so others wouldn't go hungry; we remember them best by fighting hunger. They're an eloquent sign that the WFP can effectively carry out productive activities. The credibility of an institution comes from its members' work. Communications technologies mobilize responses of compassion and solidarity, but information overload leads us to grow immune to others' tragedies, seeing them as “natural.” We see images of pain but don't not touch it, we hear weeping but don't comfort it; we see thirst but don't satisfy it. Human lives become news, but pain, hunger, and thirst remain. This demands more of us and makes us realize the role of institutions like yours. We can't just be aware of problems, offer reflections, or engage in discussion; we need to “de-natural-ize” poverty and see it as reality, not statistics. Poverty has a face: of children, families, young and old people, the unemployed, those lacking opportunity, those forced to migrate.... Many are starving; we can't just say it's fate we can't do anything about. Once poverty loses its face, hunger, food, and violence can become dissociated from real people. Bureaucracies shuffle papers; compassion deals with people. We need to “denaturalize” and “debureaucratize” poverty and hunger by intervening, focusing on real people in need, and exploiting enthusiasm and potential. “Denaturalizing” poverty: There's enough food for everyone, but not everyone can eat. Food shortage is not natural; people suffer from it because of a selfish distribution of resources and food “merchandising.” The earth, exploited, yields fruit, but we've foiled its purposes; we've turned a gift for all into a privilege enjoyed by few. Consumerism has made us grow accustomed to excess and waste of food, but discarded food is in a sense stolen from the poor and starving. We must identify ways to share it. “Debureaucratizing” hunger: Some issues have been bureaucratized, some activities shelved. In this world at war, arms sideline other ways to resolve issues and prevent food from being distributed. Aid is obstructed by political decisions, skewed vision, and customs barriers, but weaponry isn't. Arms feed wars, not persons. Hunger is even used as a weapon. People dying of hunger and thirst are added to battlefield casualties and civilian victims. But we become anesthetized, desensitized. Force becomes our way of acting and power our goal. The vulnerable suffer war's effects and don't get help. We need to debureaucratize whatever hampers humanitarian assistance. We need heroes like you to blaze trails, build bridges, and open channels concerned with the faces of the suffering. Member states must cooperate more with you, so you can carry out sound projects and promote long-term development. 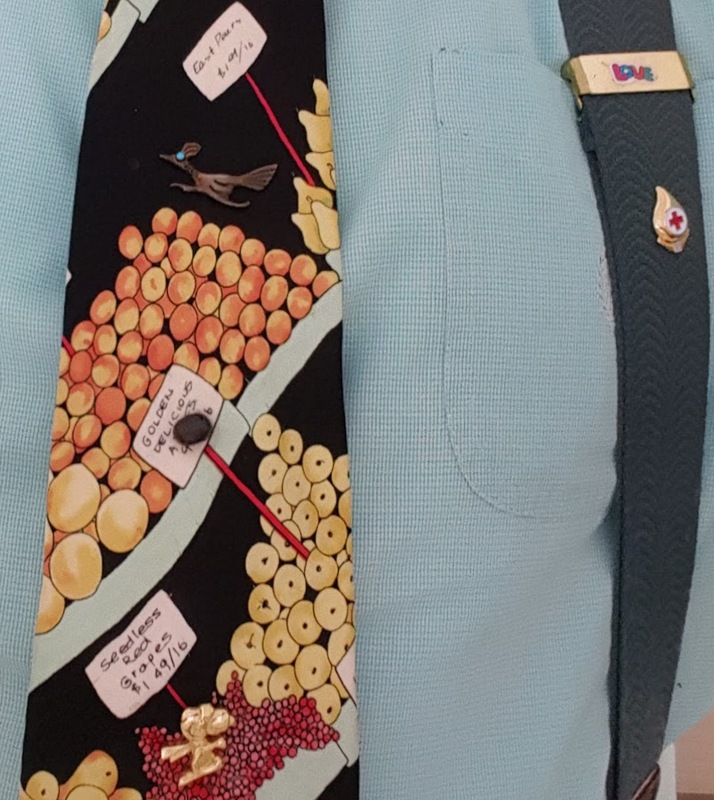 You coordinate scientific knowledge, technical decisions, and practical actions with efforts to obtain and impartially distribute resources, ensure development of local capacities, and gradually eliminate external dependence, while reducing food loss and waste. You're an excellent example of fighting hunger through better resource allocation, strengthening the local community. Don't grow weary or discouraged; pursue your mission enthusiastically. The Catholic Church supports your efforts to protect the dignity of persons, especially those whose rights are violated. “I was hungry and you gave me food, thirsty and you gave me drink” embodies an axiom of Christianity but serves as a golden rule for all. Our ability to help the hungry and thirsty measures the pulse of our humanity. May our fight to eradicate hunger and thirst challenge us to seek creative solutions. 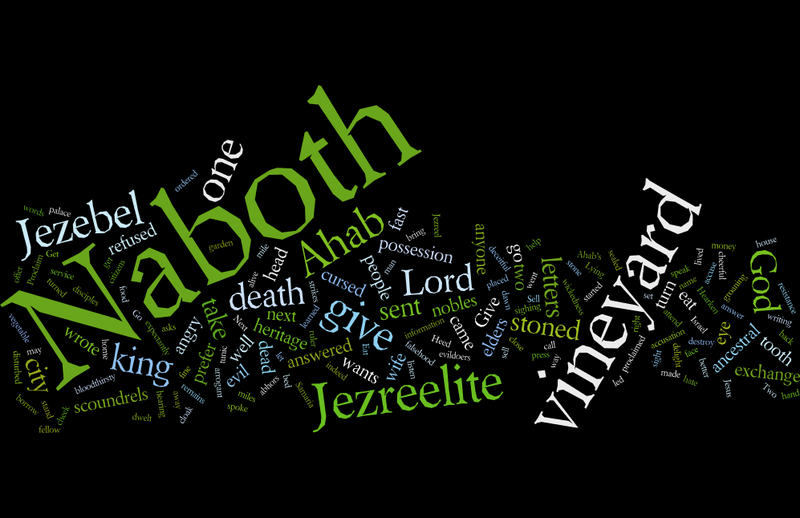 1 Kgs 21:1-16 Naboth had a vineyard next to the King Ahab's palace. 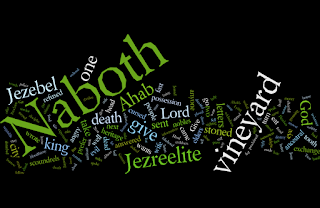 Ahab / Naboth: “Give me your vineyard to be my garden; I'll pay you or trade it for a better one.” / “God forbid I give you my heritage.” Ahab went home angry. His wife Jezebel / Ahab: “Why so angry?” / “Naboth refused to let me have his vineyard.” / “Be cheerful; I'll get it for you.” She wrote letters in his name and sent them to elders and nobles: “Get scoundrels to accuse Naboth of cursing God and king, then stone him.” They did as she ordered, then let her know he'd been stoned; she told Ahab, “Take possession of the vineyard; Naboth is dead.” Ahab went to the vineyard and took possession. DailyScripture.net: "Do not return evil for evil": Jesus approached the question of retribution with a new standard based on the law of grace, love, and freedom. Jesus knew the old law and its intention to limit vengeance as a step towards mercy; it served as a guide for a judge to assess penalty. The Old Testament commands mercy: don't take vengeance or bear a grudge, but love your neighbor; if your enemy is hungry or thirsty, give him bread or water; don't say, "I'll do as he's done to me; I'll pay him back"; give your cheek to the smiter, and be filled with insults. Jesus transforms the law of mercy with grace, forbearance, and kindness; there's no room for retaliation. We must seek the good of those who wish us ill.... Only the cross can free us from the tyranny of revenge and resentment and give us courage to return evil with good; such love can heal. Since God has been merciful to us, we're called to be merciful to others, even those who harm us. Universalis: Anthony of Padua, monk, Franciscan friar; missionary to Africa, Italy, and beyond; theologian, "hammer of heretics," "evangelical doctor," "lost and found" patron; see also Wikipedia.